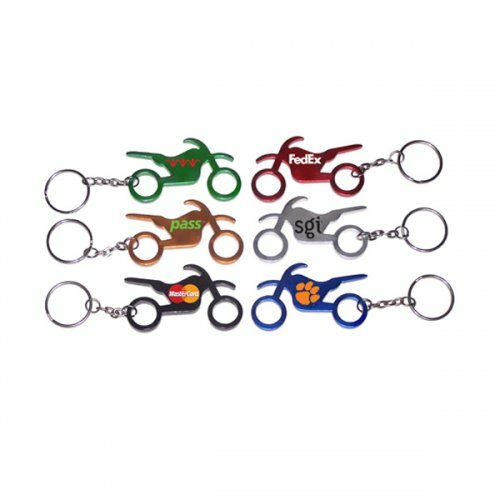 Hold on tight and drive safely by involving this customized motorbike shape bottle opener transportation keychain. It is going to take your brand for wild ride. It makes a terrific brand giveaway for motorcycle repair and maintenance stores, accessories, motorbike showrooms and many more. It helps users by nipping of the bottle tops or can tops and hanging keys. We can easily imprint your logo or slogan over it, thereby earning you much easier introduction in lives of your intended customers. 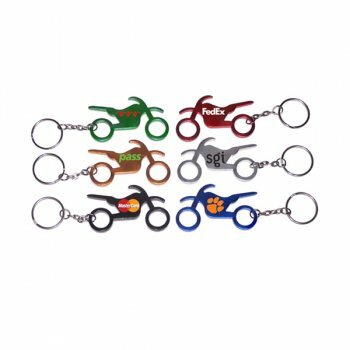 Request a quote to know discounts on wholesale promotional motorbike shape bottle opener transportation keychain. Features – Motorbike shape bottle opener keychain in aluminum with metallic color finish. Available Colors - Metallic Black, Metallic Gold, Metallic Red, Metallic Blue, Metallic Green and Metallic Silver. Imprint Method - Printed & Full Color Process & Laser Engraved.